I'm hesitant to say I've made a full recovery from my ankle injury, because I know these things can revert as quickly as the days have become shorter, so I'll just settle for a "running rebound" in August. The days are noticeably shorter - each morning run starting a little darker than the previous day's. I've always noted that once the calendar flips to August, it feels like a light switch flips, and we become enveloped in darkness in the early morning and evening. The transition takes getting used to - getting up in the dark, donning reflective gear and lights. Soon, the entire run will be in the dark - I can't say I'm looking forward to it. I am, however, looking forward to some cooler temperatures and less humid conditions! Summer, taunting the kids that started back to school, finally decided to show up. Walking out into the heavy, sticky air, the hardest step to take is that first one. Then I remind myself "I get to run today" and my perspective is changed. So we slog through the miles, drenched with sweat at the end, making sure to properly hydrate along the way. 1. Post Run - Felt good to get 12 miles in today, 2. Mile 6 Reward , 3. Fire and Water , 4. Parade In , 5. Walk on By , 6. Obstacle Course this Morning!, 7. Lose Yourself, 8. Settling Down , 9. Jump Over Or Splash Through? , 10. Sadly, this happens at the end of the run now., 11. Just the Start of Today's Long Run , 12. Good Morning, Sun , 13. Clouds and Wee Little Moon, 14. Misty Morning Run , 15. It was a Run in the Rain This Morning. Unexpected, but welcome! , 16. Like the Countryside , 17. Throw Me a Curve , 18. Pretty Tired of the High Humidity. August's Stats: 136 miles, 9:16 minute / mile average pace. I'm happy with it all, considering how fast I ramped up the mileage in order to get back on track for the Chicago Marathon. I am also fortunate that I've got a good group of people to run the really long miles with - they are my support line. My goal is to simply stay healthy for the next 6 weeks and do the best I can. Even if you aren't a runner, these tenets hold true for any passion - I hope you hold on tight to those passions and never take them for granted. Bravo to you - the resolve to get out there and take that first step is a testament to how much you enjoy this labor of love. I'll stick to walking (running just never clicked with me, plus a bum knee). You certainly have collected some beautiful memories along the route and you are right - August is the beginning of the end of longer days. You had some really beautiful views on your runs, Shirley. I actually love to run in the dark! Not at night though. Love 4 am! Thanks for stopping by my blog. 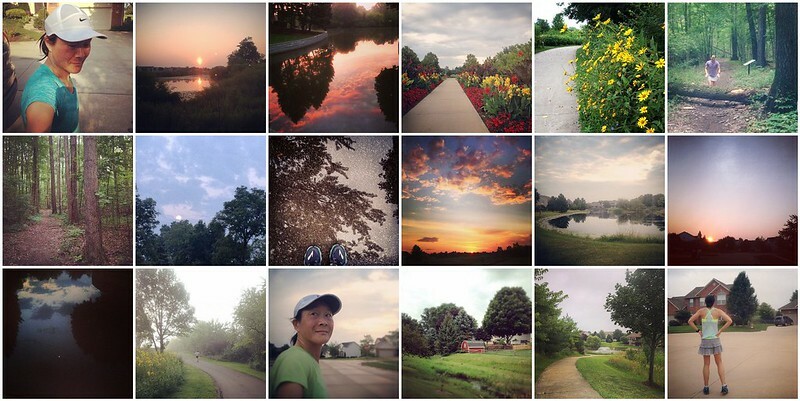 I'm happy I found another great blog to follow--running & gorgeous photos! Love these pics but #3 is my favorite. Also love the quotes.